Remember when the Aeropress was your best and arguably only good bet for coffee in the wild? Your options are endless now, and here’s the weirdest/coolest one so far. 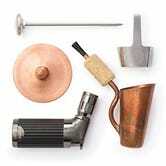 The Bripe is a copper ultralight coffee brewing vessel with attached straw. Pour in grounds and water, heat with blowtorch, check temperature with thermometer, and you’re off to the races. And it’s pretty good! Temperature is one of the most important variables in coffee brewing, and since you’re staring at a thermometer with Bripe, there’s no excuse to screw that one up here. You’ll still need to pack a grinder (yes), or grind your beans beforehand (no), but assuming you’re willing to supply good, well-ground beans, Bripe will serve up some excellent coffee on your next hike, while adding very little weight in the process.